UPDATE (since I'm getting some readers from the shout-out on Inside Higher Ed): for information about the non-tenure-faculty labor action at the University of Illinois at Urbana-Champaign, see the student newspaper's coverage, the local newspaper's coverage, and the union website. The strike vote was tallied last night for NTFC Local 6546, and the members authorized the union leadership to form a strike committee and take labor action. It's still not about the money. Except that, in a state currently undergoing budget meltdown, everything is always going to be about the money. All the regional state universities are in funding freefall as a result of the budget stall-out, and (one is given to understand) even the state flagship will soon be suffering--all of which makes a certain intuitive sense, until you look at the numbers. The state's support for the U of I has been steadily declining for years now, prompting the U of I to steadily increase tuition. Tuition is now 300% of what it was when state appropriations started falling, and the institution now has more money coming in than it would have if state appropriations had stayed steady. Money talks, and in a manufactured crisis, the lack of money talks even louder. 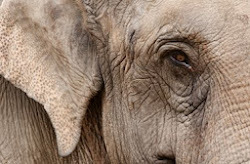 NTT faculty are often brought on board to fill in the gaps that (one is, again, given to understand) can't possibly be filled by creating a tenure-stream line. Those gaps get wider all the time as the numbers of NTT faculty grow, and with them the absurdity of their year-to-year positions. 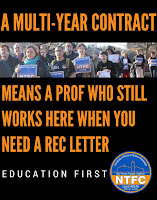 Some members of NTFC have been "visiting" faculty for upwards of a decade; many more have been on de facto multi-year contracts that get parceled out one year at a time. As the administration uses the state's budget woes as an excuse to enact large scale changes, these situations will multiply. The administration wants to negotiate a contract in which NTT faculty must "aim high" in their teaching and scholarship without institutional agreement about the extent to which they can count on the protections of academic freedom, in which NTT faculty can only control their destinies by finding work elsewhere, and where "accountability" depends solely on the initiative and good will of the individuals empowered to hire and fire them. 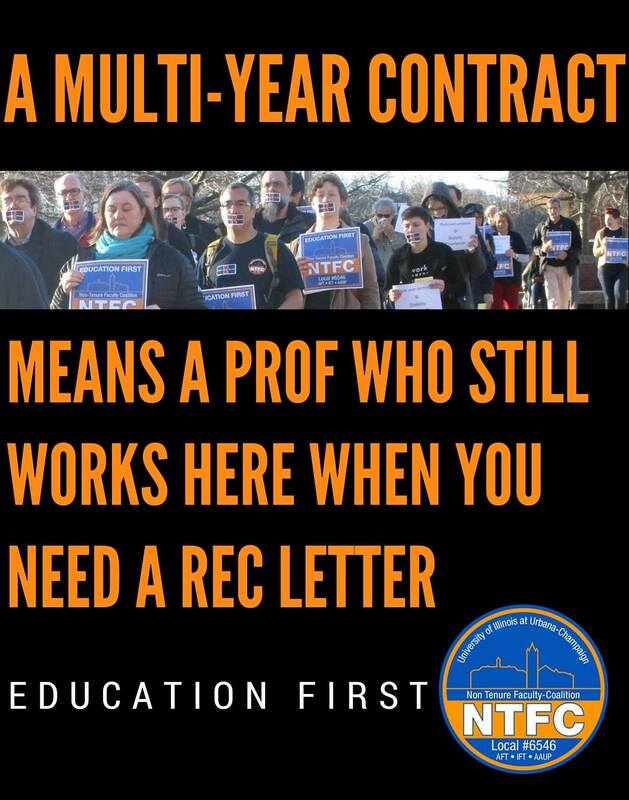 In no way do the administration's proposals convey an institutional commitment (which some think NTTs should have faith in, in place of a contract) to treat NTT faculty with dignity and respect. NTT faculty continue to provide excellence, quality, and service because they are professionals who take pride in their work, even if the university doesn't. Does any of this foster innovation and creativity? Again, innovative and creative professionals will go on doing what they do--but excellence in spite of institutional neglect is not what the U of I should be striving for.